Applications are invited for Geographical Society of Ireland postgraduate travel awards to a maximum value of €250 per person/awardee. These bursaries are intended to offer financial support to postgraduate members of the GSI who wish to present papers or participate in workshops at national or international conferences. 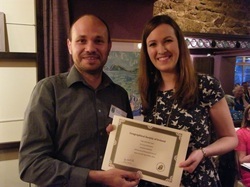 Awards are also available to postgraduate researchers requiring assistance to undertake fieldwork. Preference will be given to applications in support of dissemination activities. Completed application forms should be submitted online by 5pm on 14th February 2019. Successful applicants will be expected to acknowledge the support of the GSI in their research and at the relevant conference. A brief overview of how the award was utilised should be submitted to Geonews after the event. Those in receipt of the awards will also be expected to attend the official award ceremony in May 2019 at the Conference of Irish Geographers, NUI Galway. The Geographical Society of Ireland is pleased to announce a call for its annual prize for a presentation based upon a recent PhD thesis in geography. The competition is open to any graduate of a Higher Education Institute on the Island of Ireland who has successfully defended their PhD degree since January 1st, 2015. Papers will be short-listed for presentation at a special plenary session of the Conference of Irish Geographers (CIG), May 2019, NUI Galway. Applicants must be registered for the Conference and be available to present (presentation of 10 minutes, plus 5 minutes Q&A). The plenary session will be adjudicated by a panel of senior academics. The winner of the Prize will be announced at the Annual CIG Dinner. The prize includes an award of €250. The GSI is pleased to announce a call for submissions for its Book of the Year award. This year there will be two book awards: (1) Edited book; and (2) Monograph. be comprised substantially of previously unpublished work. Two award categories have been established this year: (1) Edited collections and (2) Monographs. Scripts are not eligible for consideration. One nomination from a GSI member is required. Completed application forms should be submitted online by 5pm on Wednesday January 31st 2018. Successful applicants will be expected to acknowledge the support of the GSI in their research and at the relevant conference. A brief overview of how the award was utilised should be submitted to Geonews after the event. Those in receipt of the awards will also be expected to attend the official award ceremony in May 2018 at the Conference of Irish Geographers, Maynooth University. The Geographical Society of Ireland is pleased to announce a call for its annual prize for a presentation based upon a recent PhD thesis in geography. The competition is open to any graduate of a Higher Education Institute on the Island of Ireland who has successfully defended their PhD degree since January 1st, 2014. Papers will be short-listed for presentation at a special plenary session of the Conference of Irish Geographers (CIG), May 2018, Maynooth University. Applicants must be registered for the Conference and be available to present (presentation of 10 minutes, plus 5 minutes Q&A). The plenary session will be adjudicated by a panel of senior academics. The winner of the Prize will be announced at the Annual CIG Dinner. The prize includes an award of €250. The deadline for applications for the Prize is 5pm on Wednesday January 31st 2018. If you have any queries please contact secretary@geographicalsocietyireland.ie. More details about the recipients of these awards will be available here soon. Gerry Kearns, David Meredith, John Morrissey. Eds. 2014. Spatial Justice and the Irish Crisis. Royal Irish Academy Press. Dr. Eoin O'Mahony -- St. Partrick's College, DCU - Phd Graduate, Department of Geography, Maynooth University. The GSI 2014 Geographer’s Contribution to Community Award was awarded to Professor John Sweeney, NUIM, (pictured here with Prof. Anna Davis, TCD, 2012 Awardee at the 2014 CIG). Professor Sweeney was recognised for his contributions to Ireland, ranging from advocating policy changes to protect the Irish environment to informing Irish people on the science, importance and relevance of climate change through the media. Prof. Sweeney has also made significant contributions to the local community, including through the Maynooth Planning Alliance, the Maynooth Fair Trade Town Committee, and the NUIM Green Campus initiative. 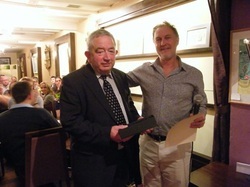 Dr. Arnold Horner, UCD, was honoured with the GSI 2014 Lifetime Achievement Award, the premier award of the Society (pictured here with Gerald Mills, UCD). His research interests include the history of cartography in Ireland, historical geography, including landscape change, and aspects of, and messages from, Irish maps 1750-1850. A continuing research project is the impact of the Bogs commissioners of 1809-14. He was the Reviews Editor of Irish Geography from 1976-2006 and is part of the Irish Environmental History Network at TCD. Dr. Horner is a regular guest of the Royal Dublin Society's Library Speaker Series for his research about the Irish cartographic history, and he has instructed hundreds of young students in economic geography, regional development, and cartography and the University of Liverpool and UCD. Two GSI postgraduate travel awards were awarded to Sinead O'Connor, UCC, and Diarmuid O'Connor, NUIM, for fieldwork and/or presenting papers at international conferences. The GSI is delighted to honour Dr. Laura Devaney (TCD) with the 2014 Doctoral Research Award (pictured here with Prof. Mike Raco). Her PhD was entitled 'The governance of food risk in Ireland: Sustainability, biosecurity and communication'. Shortlisted Books for GSI 2014 Book of the Year Award. ﻿John Crowley, William Smyth, & Mike Murphy. Eds. 2012. Atlas of the Great Irish Famine, 1845-52 (Cork University Press). Frances Fahy & Henrike Rau. Eds. 2013. Methods of Sustainability Research in the Social Sciences (Sage). Mark McCarthy. 2012. Ireland's 1916 Rising: Explorations of History-Making, Commemoration & Heritage in Modern Times (Ashgate). Julien Mercille. 2012. Cruel Harvest: US Intervention in the Afghan Drug Trade (Pluto Press). Rory Hearne, NUIM, receives award from Niamh Moore-Cherry, UCD, & Pádraig Carmody, TCD. Eoin O’Mahoney, NUI Maynooth Funding received to disseminate work at Nordic Geographers conference and network to develop comparative perspective. This is a very topical issue in Irish public life and therefore could make an important contribution to ongoing and emergent public policy debates. Richard Scriven, UCC Student Funding received for fieldwork – his research requires travel to the pilgrimage sites around Ireland. This GSI will assist with travel and fieldwork costs. This inaugural prize was established to recognise a geographer working in Ireland who has made a significant contribution to wider society, community, environment and politics at the national or local scale. The winner was Prof Anna Davies, of Trinity College Dublin, in recognition of her direct work with communities and at national policy making level. Anna is a member of the Environment Pillar of the National Economic and Social Council and she works directly with communities through her membership of the board of the Rediscovery Centre in Ballymun. Book of the Year Award 2010/11: Dr. Padraig Carmody, TCD, Globalisation in Africa: Recolonization or Renaissance? (Lynne Rienner, 2010).